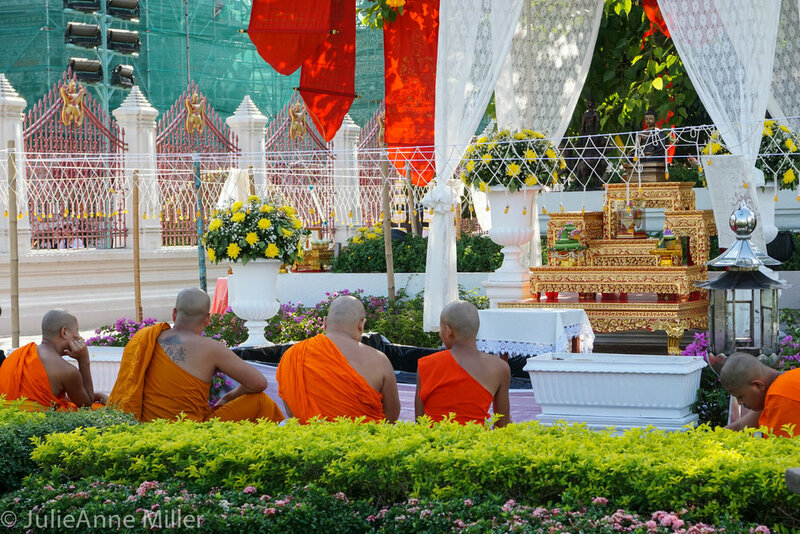 We were in Bangkok during the Loi Krathong festival. 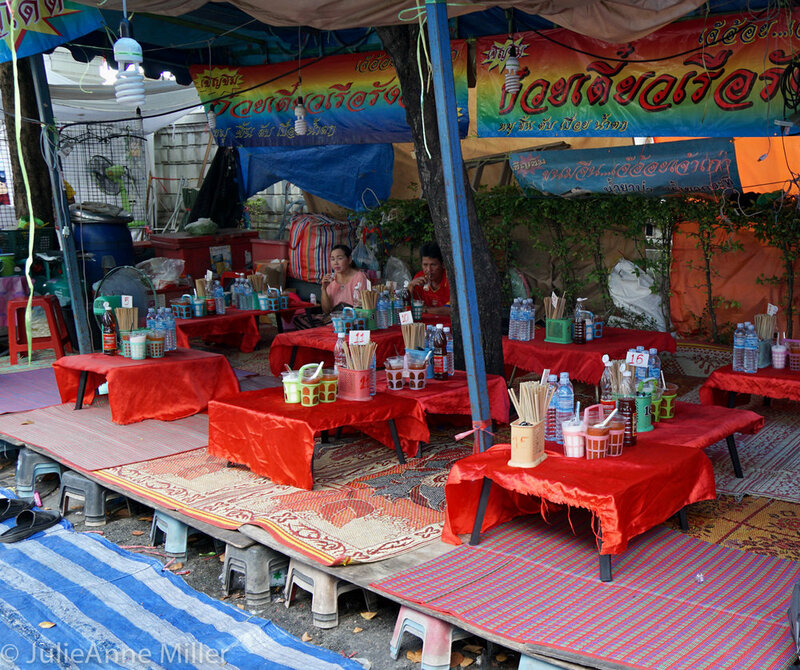 This is an ancient annual event celebrated throughout southern Thailand. On the night of the last full moon of the (Lunar) year, people float lighted candles in decorated banana leaf baskets in lakes and rivers to honor Buddha. Floating the "krathong" in water symbolizes letting go of one's hatred and anger. 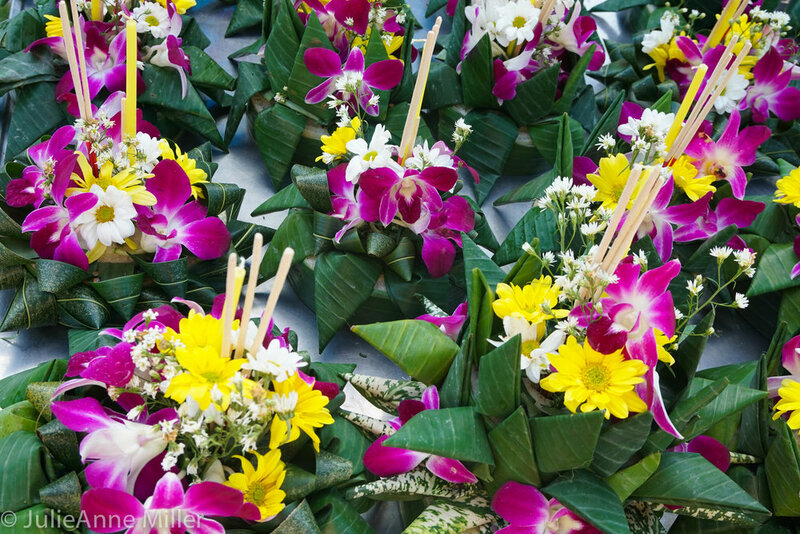 Throughout the week of Loi Krathong, the temples are in full festival mode, with colorful banners, special prayer ceremonies, live dance and music shows, and even carnival games and food vendors. At the temples, people write their wishes, say prayers and give donations. The apex of the event is when everyone gathers to float their boats. People everywhere were in high spirits and you could feel the excitement in the air. We followed the advice of several locals who told us to make dinner reservations at Asiatique in order to see the climax of Loi Krathong: the fireworks show. We took a ferry to the Asiatique port. It was now late afternoon and the city was starting to move in preparation. Masses of people crowded onto boats; I ended up crammed against a railing, barely able to breathe. I just kept my eyes closed and silently prayed that the boat would not tip...while also constructing various "what if" scenarios in my mind and planning my escape route. Ugh. It was scary. All's well that ended well and thankfully we arrived as the sun was starting to bow. We had an amazing several-course dinner, enjoyed the carnival and sent our anger and fears adrift in a krathong down the Chao Phraya. The thrill of our evening was the journey back to the hotel. The ferries were crammed, so we joined a throng moving towards the street. After walking about two miles, we finally realized we could hail a street bike. Zooming through the humid night air, whizzing past cars and crowds, zig-zagging through crammed intersections - it was the thrill of a lifetime!